We offer visa support only to our clients who have registered for a full package Damavand Private Tour. Please remember we are not an Iranian visa agency and we are not interested to support any other visa request/application. Foreigners who are interested to travel to Iran, and climbers who intend to climb Damavand, can get 15 to 30 days tourist visa. 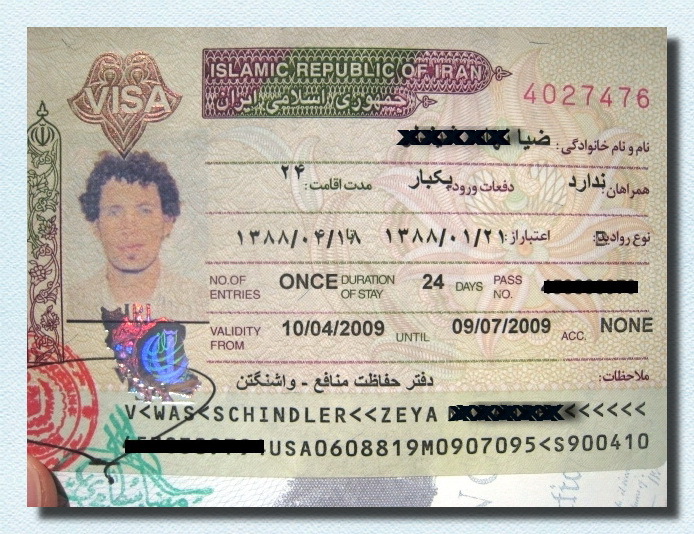 The visa is issued for foreign citizens to visit Iran or to meet their friends and relatives. You may get a tourist visa in different ways, it all depends on your nationality, the country of you birth/residence and which embassy/consulate you refer to. Please Read Important Note for Iran Visa. The visa application should be completed and send to MFA in Tehran with the necessary documents 30 days before your arrival time. As the political climate changes, the visa rules also may change quickly without any prior notice. The Iranian visa rules are different for various countries, we are not certain for the latest changes in visa policy for your country. That is why we recommend you to try to get the latest visa info via other visa sources too and register your tour after you are quite sure about obtaining the visa to Iran. If you could not find a reliable visa source, then we may start your visa procedure. Participant who need this support should apply ASAP to enable us to get their visa in time. When you apply for Iran's visa, most consulates ask for a so called reference number or visa authorization code from the MFA in Tehran. To get this reference code, you must apply through an Iranian travel agency to the MFA, this procedure takes about 2 to 4 weeks time, so the sooner you start the process the better, the code is only valid to the consulate as mentioned in the application forms. After receiving it, you will be informed by email. Having this number is the main step in the visa procedure and the rest is easy. By that code you refer to the embassy of Iran in your country with the necessary documents and your passport may be stamped with Iran's visa in the same day. Multiple visa application in any shape is not recommended and may cause a refused visa. Unfortunately there are some restrictions for USA citizens wishing to get Iran's visa. At the moment the only way is to take part in a guided tour and it must be applied only through some certified authorized travel agency in Iran. 1- Your desired exact itinerary, we recommend 5 days itinerary, should be submitted to the Security Office of Cultural Heritage Organization in Iran. The US visa process will take more than usual time and will cost more than an ordinary visa. 2- You should book and mention the names of hotels and Mt Damavand Camps in your itinerary in advance. 3- After submission, you are not allowed to change the itinerary! 4 - You should have a certified guide with you all the time! 1- The certified authorized travel agency in Iran will apply for the so called Visa Reference Code, for your visa, when they receive the Reference Code, they will email you the number. 2 - By that code you ask your nearest Iran's intrest section, ie in Washington (http://www.daftar.org/ ) with the necessary documents. 3 - In a few days prosses, your passport will be stamped with Irans's visa. 4 - When you book as a climber with certified authorized travel agency in Iran, a work order by your name, as an American mountaineer and travel agency as your guide will be issued by the travel agancy with your defined itinerary and a "Trafic Code" as your travel permit in Iran. 5- Being accompanied by a guide is an obligation and rule for American citizen(s) here! Both the guide and the travel agent have to make a separate report of the tour afterwards! Welcome to join us for the best Iran ski and climbing tours. Damavand ski and snowboard expedition tour 2015. Leading outdoor activities tour organization. Iran Tourism Visa - Damavand Tour. Iran Tourism Visa for Climbing Mount Damavand. iran visa, iran visa support, iran visa authorization code, iran visa reference number, iran tourism visa, visa damavand tour, iran tourism visa support, visa damavand, hiking visa iran mountains, damavand tourism visa, Invitation Letter for Iran Visa, Iran Visa for American Citizens, Visa On Arrival VOA, Visa Process, Iran Visa Cost, Iran Visa Application Form, Iran Visa Support 2015, Iran Visa News for UK & Canada Citizens. Damavand tour organizer for trekking, mountaineering and climbing tour. Damawand off-piste ski and snowboard expedition tours. Demavand winter climb and and ski touring with the most experienced Iranian local guide. Specialist in guided mountain tours and ascends. Trek and climb tour organizer in summer and winter mount touring and tourism. Guided hiking Persia adventure tour. Guided tour climbing, ski touring and ski mountaineering expedition Iran. Transfer and transport tehran. Mountaineering news. Difficulty and climbing grade. Copy the following visa form and paste it to your email client, complete it with the necessary info and send it by email together with a scanned copy of first page of your passport (only the image of the page which your photo is attached), each person need to fill in a separate form and send a separate copy of passport. The image of passport should be quite clear, in JPG format and the size should not be more than 40KB. Make sure to enter the correct information, it should match the second form which will be submitted to the consulate later. Visa Issue Place: Which Iranian Consulate You Wish to Collect Your Visa. Best season to climb and best climbing period. Suggested route and trails maps. Specialist in Damavand guided tours and ascends. Mountaineers Info for rock and boulder climbing tour. Damavand tour 2015 trekking and climbing. Tailor made tour for hiking trekking and mountaineering in Iran. Qualified Iranian mountain guides for Damawand climb, hike & trek tours. Mount climbing and Iran adventure tours. Hiking trekking to advanced climbing tours. Winter sport adventure vacations. Best ski resorts for your holidays. Guided tour Iran. Alborz Mountains tour. Climbing tour Demavand. Persian cultural and historic, Perspolis Shiraz tour. Guided tour and excursion. Iran climbing tour organizer and tour operator. Spécialiste des visites guidées Damavand et monte. Infos alpinistes pour le rock et rocher d'escalade tournée. Damavand tournée 2015 de trekking et l'escalade. Tailor made excursion de trekking randonnée et l'alpinisme en Iran. Guides de montagne qualifiés iranienne pour la montée Damawand, de randonnée et de visites trek. Mont d'escalade et des excursions d'aventure Iran. Randonnée trekking à avancé visites d'escalade. Vacances d'hiver sport aventure. Meilleures stations de ski pour vos vacances. Visite guidée Iran. Monts Alborz tournée. Escalade Tour Demavand. Persique culturel et historique, Perspolis Shiraz tournée. Visite guidée et excursions. Organisateur de l'Iran Tour d'escalade et un tour opérateur. Specialist in Damavand Führungen und steigt. Bergsteiger Info für Rock-und Felsbrocken Klettertour. Damavand Tour 2015 Trekking und Klettern. Maßgeschneiderte Tour für Wander-Trekking und Bergsteigen in Iran. Qualifizierte iranischen Bergführer für Damawand klettern, wandern und Trekking-Touren. Berg klettern und Iran Abenteuertouren. Wandern Trekking bis Fortgeschrittene Klettertouren. Wintersport Abenteuer-Urlaub. Besten Skigebiete für Ihren Urlaub. Führung durch den Iran. Alborz Mountains Tour. Klettertour Demavand. Persischen kulturellen und historischen, Perspolis Shiraz Tour. Führung und Exkursion. Iran Klettern Reiseveranstalter und Reiseunternehmen. Specialista in Damavand visite guidate e sale. Informazioni alpinisti per il rock e arrampicata boulder tour. Damavand tournée 2015 di trekking e arrampicata. Su misura tour per escursioni di trekking e alpinismo in Iran. Qualificate guide alpine iraniano per scalare Damawand, fare escursioni e gite trekking. Monte arrampicata e tour Iran. Escursioni trekking a quello avanzato arrampicate. Sport invernali avventura vacanze. Migliori stazioni sciistiche per le vostre vacanze. Visita guidata Iran. Monti Alborz tour. Arrampicata giro Demavand. Persiana culturale e storico, Perspolis Shiraz tour. Visite guidate ed escursioni. Iran arrampicata organizzatore del tour e tour operator. Spesialist i Damavand guidede turer og stiger opp. Fjellklatrere Info for rock og stein klatring tour. Damavand tour 2015 trekking og klatring. Skreddersydde tur for fotturer trekking og klatring i Iran. Kvalifiserte iranske fjellførere for Damawand klatre, vandre og trek turer. Mount klatring og Iran opplevelsesturer. Fottur fotturer til avansert klatreturer. Vinter sport eventyr ferier. Beste skisteder for ferien. Omvisning Iran. Alborz Mountains tour. Klatring tour Demavand. Persisk kulturelle og historiske, Perspolis Shiraz tour. Omvisning og ekskursjon. Iran klatring tur arrangør og turoperatør. Специалист по Дамаванд экскурсиям и поднимается. Альпинисты: Информация о рок-н-валун восхождение тура. Дамаванд тур 2015 треккинга и альпинизма. Портной сделал тур для треккинга и альпинизма походы в Иране. Квалифицированные иранской горных гидов для Damawand подъем, экскурсии и туры поход. Горы скалолазания и туры Иран приключений. Пешие походы к передовым восхождений. Зимний отдых спорта приключение. Лучшие горнолыжные курорты для вашего отдыха. Экскурсия Ирана. Эльбрус горах тура. Восхождение тур Demavand. Персидских культурных и исторических, Персеполис Шираз тур. Экскурсия и экскурсии. Иран восхождение организатор тура и туроператора. Especialista en Damavand visitas guiadas y asciende. Montañeros Información para el rock y la roca de escalada gira. Damavand gira 2015 de senderismo y escalada. Viaje a la Medida de trekking senderismo y montañismo en Irán. Calificados guías de montaña para el ascenso de Irán Damawand, caminata y caminata tours. Escalando el monte y tours de aventura Irán. Senderos de trekking para avanzados tours de escalada. Deportes de invierno vacaciones de aventura. Las mejores estaciones de esquí para sus vacaciones. Visita guiada a Irán. Montañas Alborz gira. Climbing Tour Demavand. Pérsico cultural e histórico, Perspolis Shiraz gira. Visita guiada y recorrido. Irán subiendo organizador de viajes y operador turístico. Iran visa information service, application form, requirements, online service. Get your Iranian tourist, business and press visa. Iranian visa upon arrival, on arrival airport visa. Iran internet visa or evisa, evisas, e-visa, electronic visa. Apply for visas online through Iranian embassy, consulate or foreign ministry. Comprehensive information on Iran visa requirements. How to get a Iran visa application form the Iranian consulate. Obtain an online application for tourist visa to Iran.